From the simple, yet functional bathroom to the luxurious retreat, we can work with a variety of materials and designs to create the perfect bathroom for your needs. Our stunning bathroom designs come with expert craftsmanship and attention to detail. Our remodeling process will leave your bathroom transformed into a room you will never want to leave. Building off your ideal vision for the space, we will professionally install leading appliances and flooring. Our team maintains an unmatched commitment to quality, and we aim to exceed your expectations on every project we undertake, no matter the size. We understand that floor plans and blueprints can seem confusing and even overwhelming. That is why we make sure to fully explain every step of the project, answering any and all questions you may have. 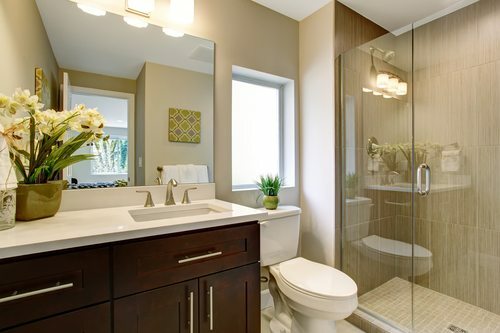 A bathroom renovation is a simple step toward increasing your home both aesthetically and monetarily. We know that every customer wants renovations to increase the value of your home and we always work to get you the best bang for your buck, ensuring a return on the investment. The makeover process starts with a visit and a careful study of your existing bath. You’d be surprised at how just a little creativity can turn an ordinary or out-of-date space into one of the most beautiful spaces in your home. Luxury Spa Tubs and More! To learn more about our unparalleled bathroom remodeling services or to schedule a consultation, please contact us at 203-791-8345 today. DeLuca Home Improvement offers bathroom remodeling, kitchen remodeling, and more to Danbury, Newtown, Ridgefield, Wilton, Bethel, Brookfield, New Fairfield, Weston, and surrounding CT communities.